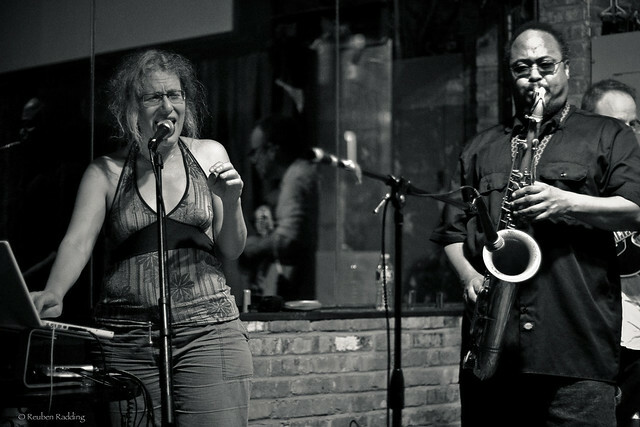 Since the mid-90’s, Dafna’s been working on ways to incorporate live sound processing into improvised music with avant-jazz leanings. Fusebox is this longtime collaboration with Ras Moshe, at various times has included bassist Shayna Dulberger, trombonist Jen Baker, guitarist Michael Gregory Jackson, drummer Andrew Drury, other drummers including Jeff Arnal and Jackson Krall and many other musicians. The links below and at the bottom of the page are for unreleased audio tracks and short excerpts, as well as online video documentation.